Russian President Dmitry Medvedev has met with the head of the Right Cause party Mikhail Prokhorov and said that he fully supported their initiatives on combating bureaucracy and the excessive concentration of power. ­At a meeting which was held in Medvedev’s suburban residence of Gorky on Monday, Medvedev said that the country needed a decentralization of political power and the debureaucratization of the electoral system, adding that all political parties must play their part in facilitating these processes. The meeting was a part of a series that the Russian President is having with the heads of all the political parties in the run-up to the forthcoming parliamentary elections. 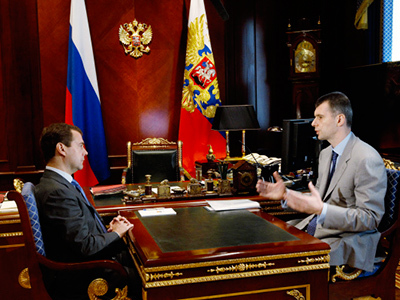 “Now we must think in what ways the whole of our system and the systemic distribution of powers, both on the national scale but more so in the regions, could become less bureaucratic, more free and significantly less driven by the center, including even those ideas which we are yet to discuss,” Medvedev said as he met Prokhorov. The president added that he hoped that Right Cause would take part in this process. 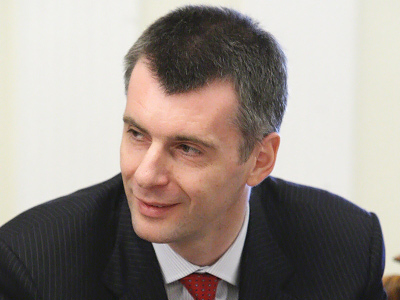 Prokhorov said that in his opinion, Russia was excessively centralized and suggested that a quarter of the seats in the lower house be given to independent single constituency candidates, which would allow talented people to enter the political arena while bypassing political parties. The Right Cause leader also said that more power should be given to regional governors. He said that if there is yet to be a return to gubernatorial elections, governors must have more money at their disposal to effectively improve the standard of living. “This calls for changes to the inter-budget system and, to some extent, the taxation system that would allow for the collection of regional taxes and empower mayors and the heads of local self-governing bodies to manage their tasks,” Prokhorov said. He added that he thought it would be beneficial to return popular elections for the mayors of Moscow and St. Petersburg – Russia’s two largest cities. The new head of Right Cause also called for the introduction of elections for lower level court officials and law enforcement agencies – prosecutors, top police officers and even tax inspectors who are in charge of collecting local taxes. President Medvedev said that he supported some of the ideas, but some needed more thorough consideration due to their revolutionary nature. The president was quick to note that he had voiced an initiative on decentralizing the distribution of power in a speech he gave at the recent economic forum in St. Petersburg. 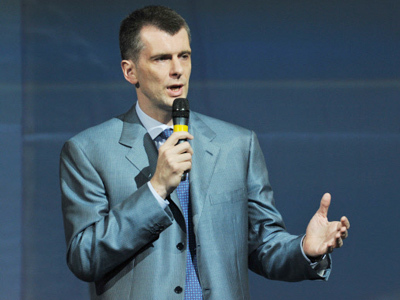 Mikhail Prokhorov, one of Russia’s richest businessmen, has only recently announced his intention to go into politics. 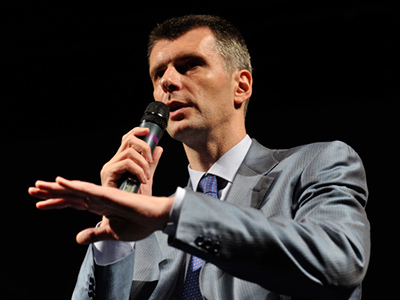 In mid-May Prokhorov said that he could become the head of Right Cause – a relatively young and small political party. 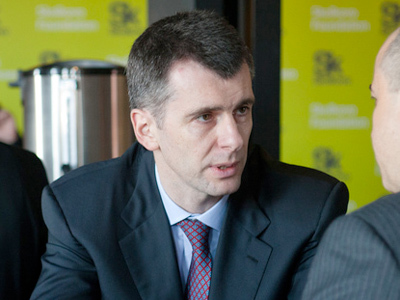 On June 25 Prokhorov was appointed the single head of Right Cause as the two co-chairmen of the party resigned. The tycoon immediately pledged to spend $100 million of his own funds for the Right Cause’s election campaign and said that he would attract more money from other top businessmen.